The last of the Ask Me Anything questions concern the blog. 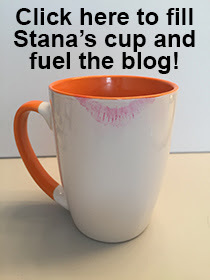 Linda asked, "From your blog, it's clear that your wife knows about Stana, but does she know that you have such a well read and respected blog? If so, how does she feel about that?" My wife is not on the Internet, so when I tell her I am a world famous skirt, she thinks I am joking. Lisa wondered, "Where do you find the girls pictures you use for the 'Femulator' section? Do the girls send you pictures and then give their permission for it to be used? And the ones of the actors used?" Google is my best friend for finding images of femulators. Girls do send me photos to use with their blessing, but the majority of the femulator photos I use were found in various nooks and crannies around the Internet. If I happen upon an image of an actor femulating for a role, I will beat Google to death trying to find other images of that femulation in order to find the best of the bunch. And if someone complains about a photo I use, I will delete it without a fuss. In all my years of blogging, that happened only once. And in that case, it was a complaint from a cisgender woman, who I mistook as a femulator. Oops! Finally, Rhonda asked, "What do you enjoy the least about doing your blog? The most?" Dealing with writer's block is what I hate the most about blogging. Once I find a topic to write about, the actual writing is what I like the most. Thanks for answering my question about your blog (and for the answers you've provided to the Ask Me Anything questions you've received). I really like the picture of you that accompanies today's post. Great little black dress and pretty shoes. Where did you find this femulator picture?? She looks very familiar to me and I can't stop thinking about this beautiful young lady!